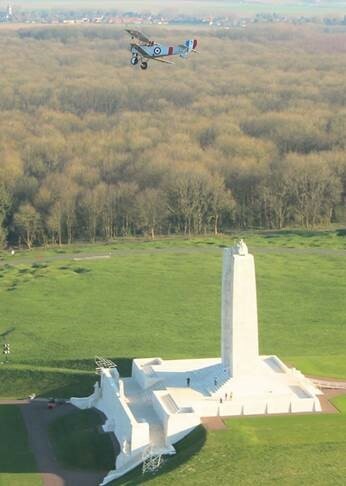 In April's COPA Flight there was an article explaining how six WW1 Replica aircraft were going to Vimy France to fly over the Vimy Monument on April 9th. This is the 100th anniversary of the famous Canadian Battle that is said to truly mark the "Birth of a Nation." Near the end of April, the RCAF C17 will transport these planes to RCAF Greenwood NS, where they will start their preparations to fly this Canadian History Lesson to numerous communities across our Dominion. Currently the confirmed stops are Moncton NB (Mid May), Debert NS CCQ3 May 20, Summerside PE CYSU May 21, Charlottetown PE CYYG May 22 (fly-in and parade), St. Hubert PQ June 4, Barrie/Camp Borden Ont. June 28, Ottawa July 1, RCAF Comox BC Sept 23, and Langley BC Nov 11. Their tentative schedule is: North West NB Last week of May, Riviere-du-Loup May 29, Quebec City May 30, Oshkosh WI July 29, RCAF Winnipeg Aug. 5, RCAF Moose Jaw Aug. 12, Saskatoon Aug. 19, Edmonton Aug. 26, Calgary Sept. 2, Interior BC Week of Sept 9th, Boundary Bay Sept 17. The PEI Flying Association and COPA 57 has financially supported the Vimy Flight as well as organized their tour of Debert, Summerside and the fly-in and parade at Charlottetown. If your COPA Flight would like to support and/or have them visit your aerodrome on this tour, you can contact one of the pilots by their regional representatives.